So what is the secret? Is it genetics, clean air, good living, old-fashioned hard work, close family connections or a combination of it all? These questions are asked about this picture of Hazel (MacLean) Beer on her 90th birthday looking healthy, beautiful and much younger than 90. 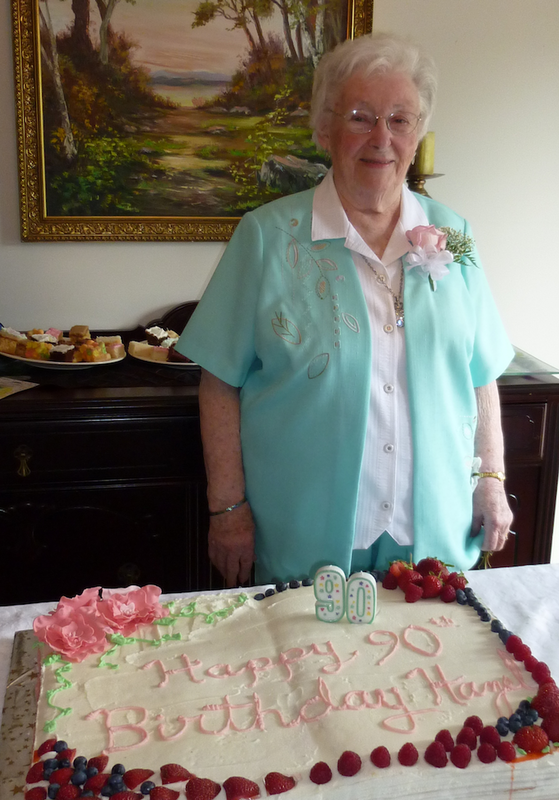 Attending her birthday party, held at her daughter Vivian’s house, are others who are also 90 or older, namely Hilda Beer, Norma MacLean, Reta Beer and Laura MacPhail. All five of these women are charming and smart. They leave others with fewer years of experience wondering how to capture this longevity and health. Hazel’s family, Doreen (Jim Pound), Blois (Audrey Dawson), and Vivian were very pleased to arrange this birthday party for their mother. They did a spectacular job of hosting with lots of delicious food and a beautiful cake custom made by Hannah Dixon of Clyde River who is currently a student of the Culinary Institute of Canada in Charlottetown. There are lots of Beer and MacLean relatives, so it made for quite a group of people. Highlights of the day included an online call that Hazel received from Jon Darrach who is working with the Peace Corps in Cambodia. Jon who is connected to the Darrach line of Clyde River is the same man that had copies of the Clyde River history forwarded to him. Later in the afternoon, Hazel received Skype calls from her granddaughters, Jennifer, who is working on assignment in Croatia and lives in Dublin and Andrea, who lives in Edmonton. Musical entertainment provided by Emily and Vans Bryant led off with one of Hazel’s favourite tunes, A Daisy a Day. It was obvious by the smile on Mrs. Hazel Beer’s face that she enjoyed her birthday party. The day will provide happy memories on quieter days. When we asked Hazel if it would be fine to feature her birthday on the community website, she said that she didn’t see why not, as they already knew about it from as far away as Cambodia.